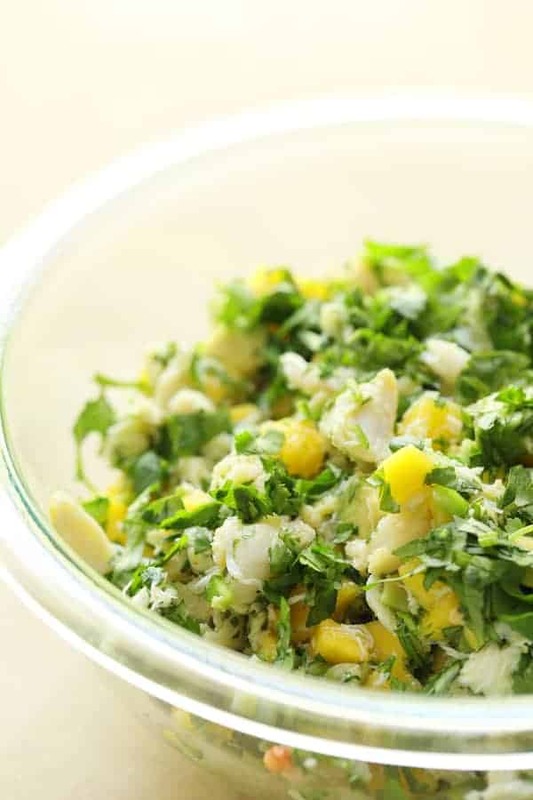 Crab Mango and Avocado Salad with Chile-Lime Dressing in Endive is a flavor explosion! It’s the perfect appetizer to make all spring and summer long! Hey, friends! I’ve got a super light and flavorful appetizer that’s perfect for serving outdoors around the pool and for every outdoor occasion this spring and summer! It’s got ALL the summery flavors going on–Crab Mango and Avocado Salad with Chile-Lime Dressing in Endive! First of all, I’ve got something really cool to share with you! On a monthly basis from now on, I’ll be sharing a menu from various food bloggers based on the concept of the progressive dinner party. If you’re unfamiliar with the concept, a progressive dinner party moves from house to house with each course. Here, you’re invited to hop from blog to blog! Please do check them out for some wonderful recipes! This month’s theme is citrus. This is one of those easy-peasy appetizers you want to have in your arsenal. A little prep work and mama! It’s super-impressive and perfect for entertaining in warm weather! Mangos can be a little finicky. It’s tough finding a good mango that’s not funky on the inside. 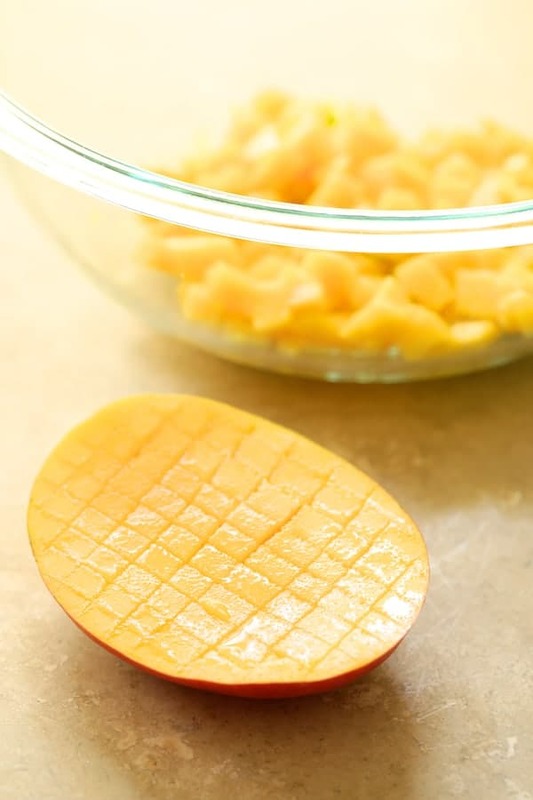 Make sure the mango has JUST a little “squeeze” to it and it looks good on the outside. A mango that’s past it’s prime is going to be extremely soft and just won’t look good. Here’s a mango shopping guide from Saveur magazine: How to Pick the Perfect Ripe Mango. I like to store mangoes in the refrigerator because they can go from ripe to ridiculously over-ripe in no time! Use the dull end of the chef’s knife or paring knife and simply cut the already diced flesh from the mango half and place it in a bowl. Add the other ingredients and ta-daahhh! A delicious, summery salad ready to serve in numerous ways! Place this salad in avocado halves for a lovely light lunch or as shown here, place it in endive leaves. 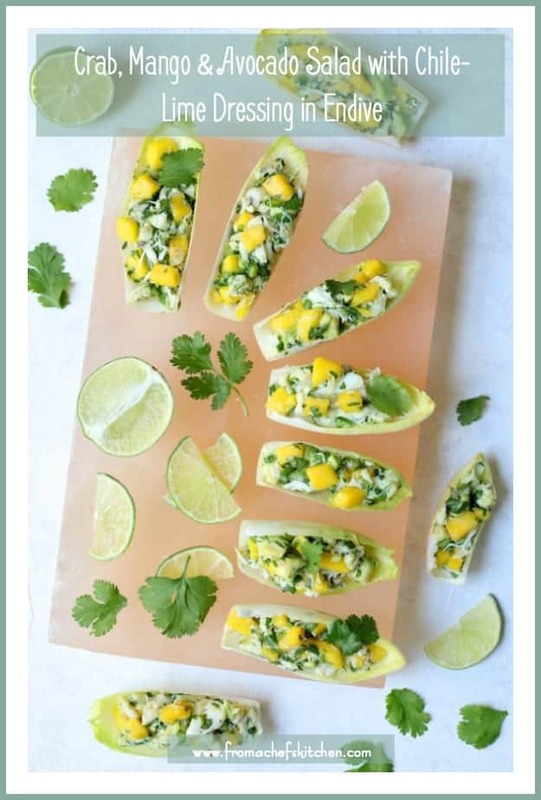 The cilantro, mango, avocado, lime, a touch of shallot makes for a lovely bite to serve all spring and summer long! Here’s a tip to get the endive leaves to lie “still” and not roll around on your serving platter. Simply shave a small amount from the bottom/outside of each one with a sharp paring knife to create a flat surface. 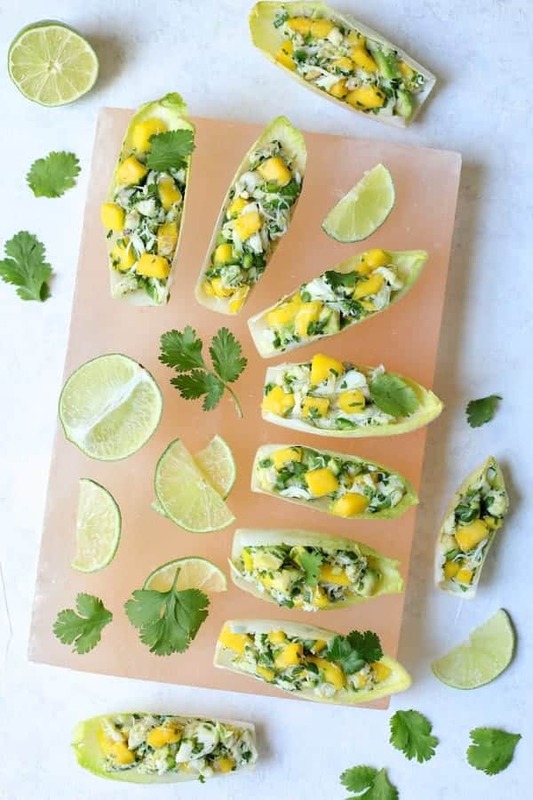 Here are two more bright and lively tropically-inspired appetizers perfect for warm-weather entertaining! Welcome to Progressive Eats, our virtual version of a Progressive Dinner Party. Each recipe in our menu this month features citrus in some form: slices of fruit, juice, rind etc. Our host this month is Laura from Mother Would Know. 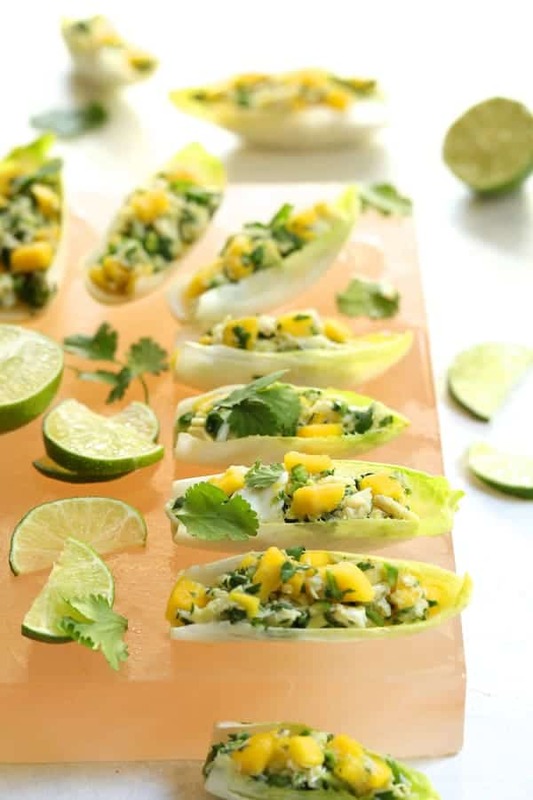 Crab Mango and Avocado Salad with Chile Lime Dressing in Endive is a flavor explosion! It's the perfect appetizer to make all spring and summer long! Combine first 9 ingredients in a small bowl. Place equal amounts of the salad in each endive leaf. 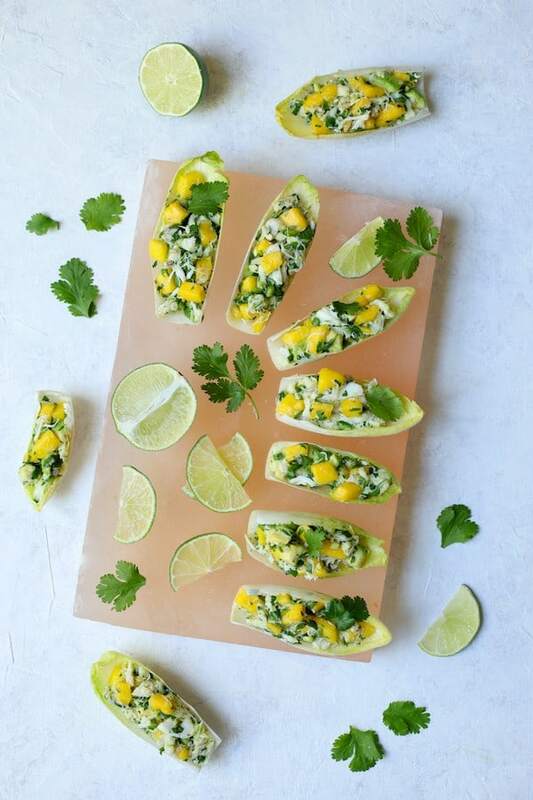 Garnish with lime wedges and cilantro sprigs. I really really love this – I’m inspired. Has all the flavors I love. Presents like a dish you’ve labored over but really, it’s simple. 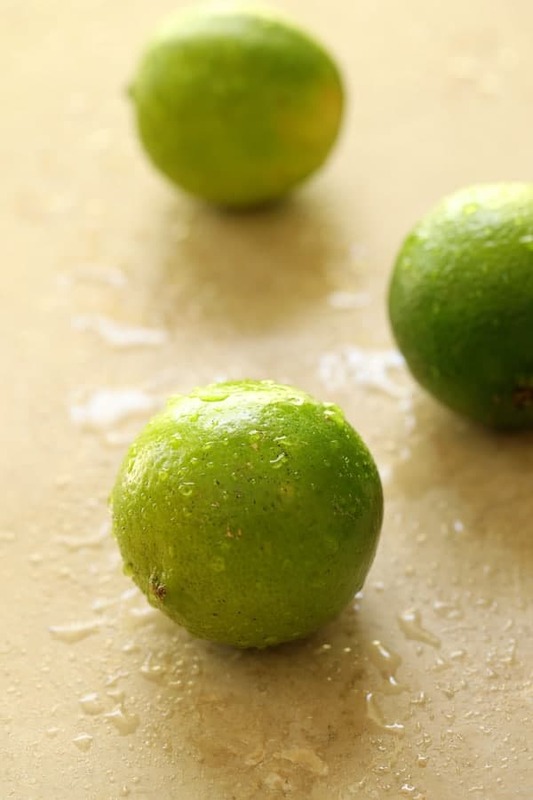 Love that photo of the water on the lime. Lovely. You had me at the word “Crab” and I just fell more in love with this recipe with each additional word! I love everything about this Carol; the flavors and color just scream spring and summer and I know we will get ours here soon. Please. So glad you’ve joined our group; I knew you would offer up something special! Thanks, Barb! Happy to be a part of such a great group! Looking forward to many more delicious menus! This is so beautiful and the perfect “fancy” appetizer for any party! I would have to double the recipe because I’m sure I would nibble this like crazy, LOL. Welcome Carol, we’re glad you’ve join us!! Thank you, Jane! Glad to be a part of this amazing concept with so many talented bloggers! I love all of your tips in this post! This appetizer is both gorgeous and delicious sounding. I’ll be trying it! Thanks, Karen! Hope you enjoy! What an incredibly beautiful contribution to our Progressive Dinner. I love the flavor combinations and I’m a huge fan of endive leaves as “boats.” Maybe the endive boats are a bit Mad Men for some, but for me they are the perfect way to serve a salad – beautiful and easy to put together. Thanks, Laura! Definitely not too “Mad Men” for me! I love Belgian endive and think it’s underutilized. Glad to be a part of such a talented group! Whoa, crab, mango and avocado??? This is one terrific, healthy appetizer, but I’d be hiding some away to eat for a gourmet lunch!! So happy you joined us this month! Thank you, Liz! This salad would absolutely be a terrific lunch stuffed into an avocado or over lettuce. Love and honored to be a part of this great concept! What a great party appetizer when the weather gets warm here! I love this. And yes, mango can be tricky! Thanks for the link!! Thanks so much, Susan! It’s sooo easy and sooo flavorful!